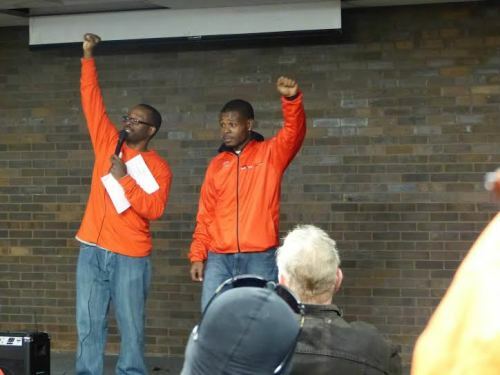 Slow Roll is an organization that began in Detroit and has since expanded to Chicago, thanks to Slow Roll Chicago co-founders Olatunji Oboi Reed and Jamal Julien. The pair have brought the Slow Roll mission to the Windy City, getting particularly involved in Southside and Western Chicago neighborhoods to promote cycling as a way of life. They are sponsoring a toy and coat drive this weekend at Golden Crust Pizza in Albany Park and at Heritage Bikes on Lincoln Avenue. Donations can also be brought to any Kozy’s Cyclery location at any time this week until Dec. 21. Check out more information online. The Addison Recorder asked Reed and Julien for their thoughts on cycling-centric pop culture, as well as the best place in Chicago to ride and get a tune-up. What’s your favorite movie about bicycling? Reed​: Bike Culture in Detroit — a Swedish Television Documentary featuring Slow Roll Detroit. Julien: ET, because it made me think about my childhood and I always wanted to fly off out of this world. And, PeeWee Herman because he had the coolest bike. What’s on your iPod when you ride? 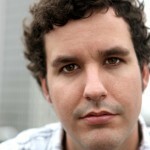 Reed​: Criolo (Brazilian hip hop artist), The Weeknd, Black Coffee (South African producer/DJ) and Jay Electronica. Julien:​ Heiroglyphics, KRS-1, La the Darkman, Goapele, and others within this genre of music. Plus corny talk radio. What’s the best street in Chicago to ride on? Reed​: Major Taylor Trail and the Chicago Lakefront Trail. Julien:​ Big Marsh bike trail and the Chicago Lakefront Trail. Best place in Chicago to get a tune-up? Reed​: Kozy’s Cyclery — all four locations are great! Your pick for essential gear to survive a Chicago winter? Reed​: Layers of clothing, warm knit hat that covers my ears, face mask, thermal sock, and thermal gloves. Julien:​ Everything Oboi said — plus the cheap hand warmers. The toy and coat drive runs until Dec. 21. 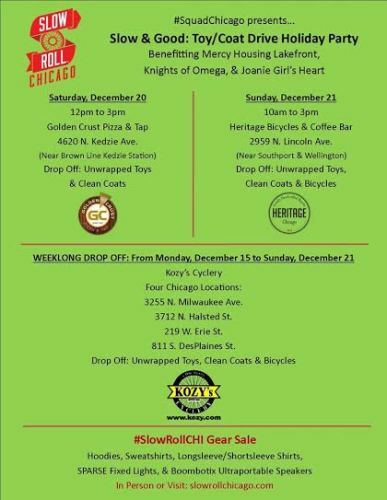 Slow Roll Chicago will be giving all donated items to Mercy Housing Lakefront, Knights of Omega, and Joanie Girls Heart.